Review Summary: On the whole CHOR MACHAAYE SHOR stands on a weak foundation ? its script. On the whole CHOR MACHAAYE SHOR stands on a weak foundation ? its script. Just this week, Police Commissioner M.N Singh complained about how Bollywood showed the Police in poor light in movies. A thief buries his loot on a construction site before getting arrested. William Shakespeare had said "that which we call a rose by any other name would smell as sweet". 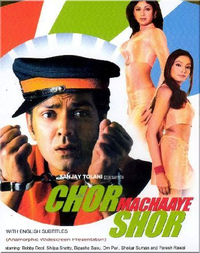 The adage can be aptly used to describe David Dhawan's latest film Chor Machaaye Shor - for it is just another film from his farce factory.